As much as we like talking about our dojo, we love it even more when our members speak for us! Scroll down and see our students awesome success stories & reviews. When you feel ready to see what our dojo is all about in person, click below to learn more about our programs & see what we are all about in person. Marc and his team are amazing! He is a great community health and wellness partner, always providing great information and services to help others. I would recommend him for anyone that is looking for a place to learn self-defense training for themselves or their kids! Always putting situations in real life terms, especially for kids to relate too! It's the positive atmosphere you want to be around. 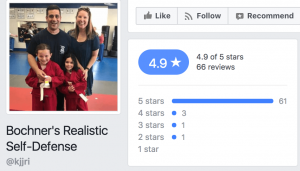 My daughter has attended Bochner's Realistic Self Defense for over a year now. Sensei Marc and his team do an excellent job with the children’s classes. The environment is friendly and inviting. Family is routinely involved in the classes. The classes are a mixture of traditional instruction time, lesson oriented games, calisthenics and "mat chats”, a discussion with the children in the class about the topic of the week. Topics include discipline, self-esteem and so on. Overall, I would highly recommend Bochner's. My son has been coming here since September, not even 3 months in and he's already learned so much. Every class is super fun, lots of laughs and always a good time even when your just sitting there watching. I would highly recommend anyone with children to come give it a try and see for yourself, promise you will not be disappointed! Awesome professional Dojo that will set you up with physical and mental skills for life. The group atmosphere is easy going and will introduce you to the use of force and self control. Not only does Bochner's teach you self defense but also teaches the greater skill of how to diffuse various situations without using force. A completely different atmosphere than other Martial Arts schools. Highly recommended! I have been attending the Kickboxing classes and love it!!! Marc & Cindy prepare an awesome class and everyone goes out of their way to make you feel welcome. If your looking for a new workout give Bochner's a try. I am a city police officer and I started training Judo/Jiu-Jitsu over 25 years ago up in Boston, Massachusetts to better prepare myself for police work. I’ve been fortunate to meet and train with some very talented martial artists over the years. Sometime around March/April of 2014, I met Sensei Marc Bochner while I was visiting one of his students at his school. I not only noticed how talented Marc is, but I also studied how well his students were moving. Marc is without a doubt very talented, he is also very polite and professional. He truly believes in a no-nonsense approach to self-defense and he and his staff are very determined with helping others reach their self-defense and fitness goals. I joined Marc’s school shortly after our meeting and I have definitely grown as a martial artist. I couldn’t be happier with the results thus far and I look forward to the years of training ahead. I highly recommend Bochner’s Realistic Self-Defense Training and Fitness Center. Wait! Are these REAL reviews??? Click here to see these reviews and more on Google.